Home » Who Should Write Your Copy? Who Should Write Your Copy? You should have a well maintained website that’s kept up to date both technically and in terms of good quality content. That’s beyond debate (if you want to be visible to search engines and avoid penalties). But it is the bare minimum an organisation should aspire to. In reality you’re in competition with rival businesses and your content should be designed to outperform theirs, both technically and in the minds of the humans who read it. Online content is broadly divided into three camps. Here’s what they are and why we need them. First there’s the standard web copy, which entails everything from welcome text to case studies to product descriptions. This obviously serves a human-facing purpose but it’s also vital to make it friendly to the bots. Second, there’s your blog. It’s your chance to announce new offerings, give your opinions on your sector and the wider world, or just to do a bit of PR. It also serves a vital SEO purpose. See Three Points of Content for more on this. Third we have standalone content marketing pieces. These are typically the result of much thought, in terms of both how likely they are to successfully attract visitors and links, and how they reflect your business and its expertise in its sector. But they could also be a fast-turnaround piece in response to a news story (newsjacking). So a single piece could take hours, days, weeks or months to complete. There’s no guarantee it’ll be a success in itself, but it’s always worth the effort because of its potential – plus the cumulative effect of various pieces over the long term. Understanding the importance of each of the above criteria will help you to decide which of the resources can help you to get the content you need. 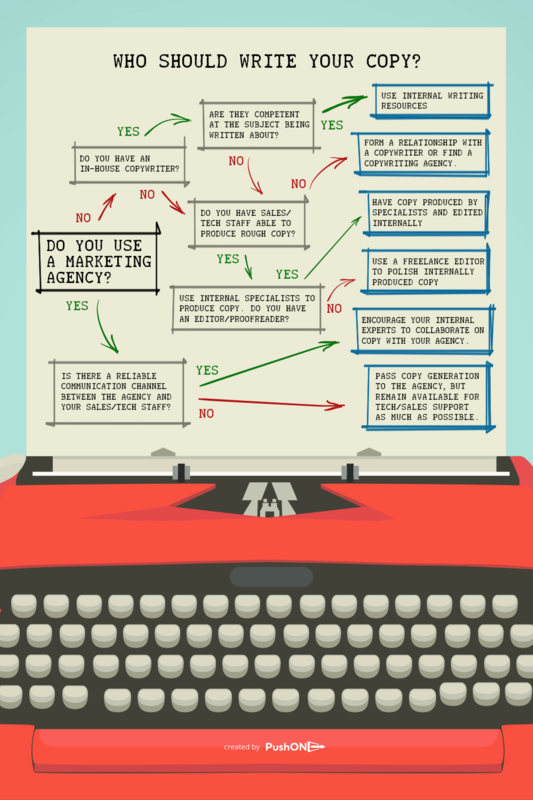 If you have in-house copywriting resources, you’ve already got the answer. They’ll be completely familiar with your industry and your particular business. They’ll know exactly how to talk to your clients and other business partners, and they’ll understand the presumptions you can make of your readers’ knowledge. Realistically, a company can only justify full-time copywriting resources if it produces a lot of copy. In-house copywriters are always going to be the best option when it comes to fast-turnaround work. Booking freelancers or agencies isn’t the best way to go as believe it or not, they’re probably not sitting twiddling their thumbs waiting for you to call. Most SMEs outside the creative industries can’t justify employing a full-time or even a regular part-time copywriter, as the requirement for content is probably irregular, often at short notice. Hold on! Doesn’t this contradict the opening part about needing regular copy? You have to be realistic about this. If you’re just producing content for content’s sake, it’s going to be rubbish, and won’t fulfil any of the reasons for doing it. “Regular” can mean two blog posts a week or even less. It’s driven by need. Freelance copywriters are great because you can take them off the shelf when you need them, then put them back on the shelf when they’re surplus to requirement. Also, you can have several writers on your books, each with different specialisms. Throw in the fact that you don’t need to pay their taxes or grant them paid holidays or sick pay and the case builds up. Businesses seldom appreciate the untapped reserves of expertise they have under their own roofs. Think of the employees you have that live and breathe the specifics of their jobs: the technicalities, the history, the client base, the politics. Imagine what wisdom they could bring to your content. Their insights can offer useful content for your clients and partners, and their contributions will have genuine value. If you’re employing the services of an agency to help push your message, they should have access to copywriting talent themselves, either in-house or freelance. For them, the calculation as to whether it’s worth employing full-time staff is often simpler because they might have several clients who require copy and will therefore be able to justify permanent resources. You’d hope that an externally sourced professional copywriter would have the ability to string words together into a compelling sentence. But having an intimate understanding of the subject they’re writing about is vital if the copy is to be credible. That’s why it’s always best to provide them with some sort of immersion – that is, letting them fully absorb your story from its original source. To immerse the writer will require devoting some time to educating them on your business, its sector and its ethos. There’s probably no better way of doing this than to invite them into your premises and spending some time with you. Let them ask questions and learn about you. Let them try out your products and see how you deal with clients; and show them how you’re different from your rivals. It doesn’t matter if they’re freelance or working for an agency – this period of immersion is vital, and although it might cost you a few hours’ worth of the writer’s time, it’ll pay dividends over the long term. It’s great to encourage all parties at your company to contribute knowledge, insight and, yes, content to your marketing effort. But you will definitely need someone with a writer’s eye to make sure your output meets the quality criteria your customers would expect of you. And you need to have a relationship that allows them to tell you – nicely, of course – when something you’ve written stinks. Companies’ employees’ attempts at literature and humour will often fall flat without developing a sturdy habit of self-criticism. Professional writers regularly realise what they’ve just written is dreadful and delete it instantly; they self-edit ruthlessly and (generally) don’t mind other people editing their work. Inexperienced writers, on the other hand, tend to labour over every sentence, pepper their prose with cliché and deviation and feel precious about their output – and get hurt when doubt is cast upon it (which can result in colleagues withholding such feedback). The above scenarios have their pros and cons, but in the real world you’ll probably find that the best solution to getting your content out there is a blend of two or more, even changing from job to job. By all means get your experts to write relevant pieces, but make sure they’re looked over by an editor, proofreader or marketing expert to give them polish and maximum marketing potential. You might have an enthusiastic blogger under your roof who’s great at capturing the spirit of your company and coming up with new angles. But you can still bring an agency in to do your larger content marketing executions. We find that by far the best results come when we, the marketing agency, and the client collaborate and share the task of idea generation and content creation and planning. No matter how much we immerse ourselves in a client’s work, we’ll never reach the levels of expertise they get from their everyday, hands-on experience in their fields. As with any business activity, avoid getting set in your ways and be prepared to be flexible with your content. Recognise that some people can write words and others have expertise in your industry. Discovering a good mix of skills that works best for you isn’t compromise – it’s optimisation.